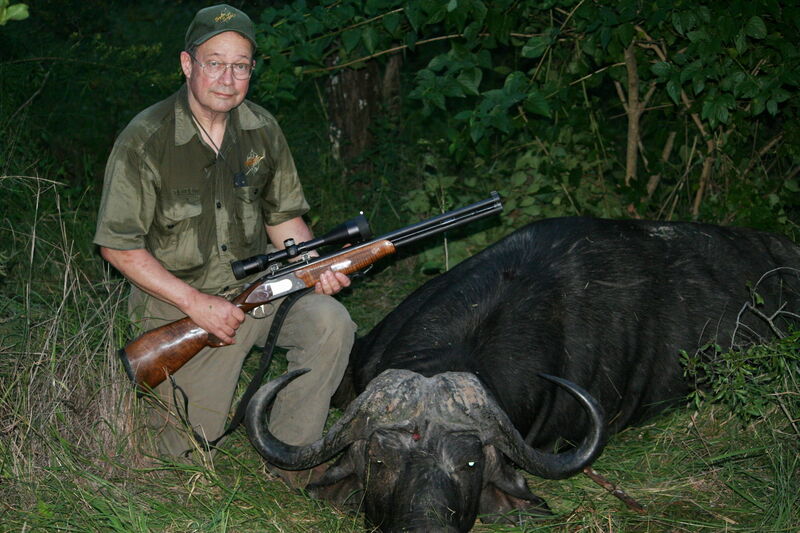 This Cape buffalo was stopped when it charged the Professional Hunter at a range of a few yards. This is one of the relatively few occasions when the author thinks a head shot should be attempted. Shooting an animal in the head or neck does not appeal to me except for some specialized circumstances. The head and neck are small targets that are frequently moving which makes sure-shot placement difficult. I have successfully made many such shots, and I have also muffed them. In general, I think that it is unwise to attempt head and neck shots except when the animal is only inches from the gun’s muzzle or you must stop a charge. 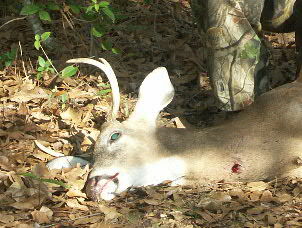 This was a successful neck shot on a deer delivered at about 15 yards. Even so, a little movement could have resulted in a wounded animal. If it were the case of missing the animal completely or hitting it, that would be O.K., but an all- to- frequent result is to hit the animals’ nose or lower jaw resulting in a lost animal that carries off a painful, ultimately deadly, injury that may result in its dying many days later. I consider it far better to maybe loose a little shoulder meat and take the animal through both lungs. As always, there are exceptions. When shotgunning for swan, geese and similarly big birds, I think it best to shoot for the long neck and head, rather than for the body because of the difficulty of the shot (particularly steel shot) to penetrate deep enough to cleanly kill the bird. 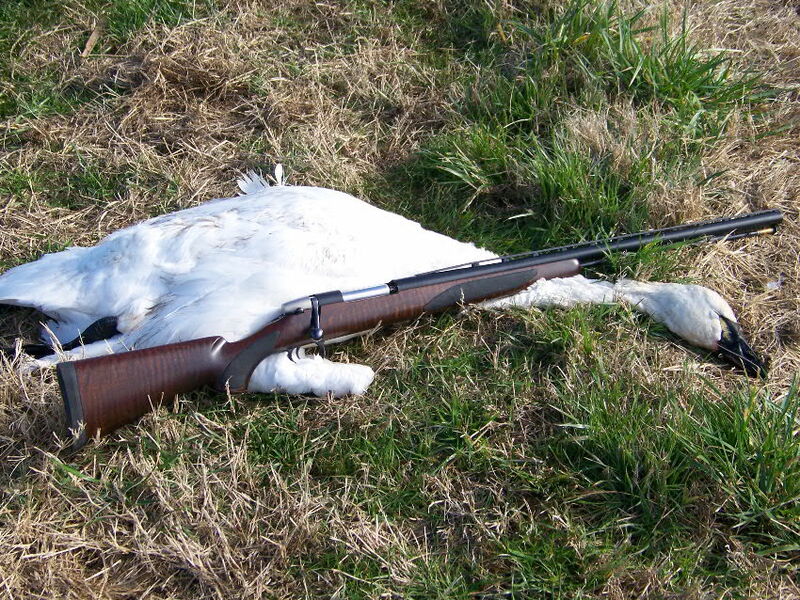 Large birds like turkeys, swan and geese are best taken by heavy loads of shot directed at the long neck and head, rather than attempting to penetrate the heavy feathers and muscles protecting the vital organs. 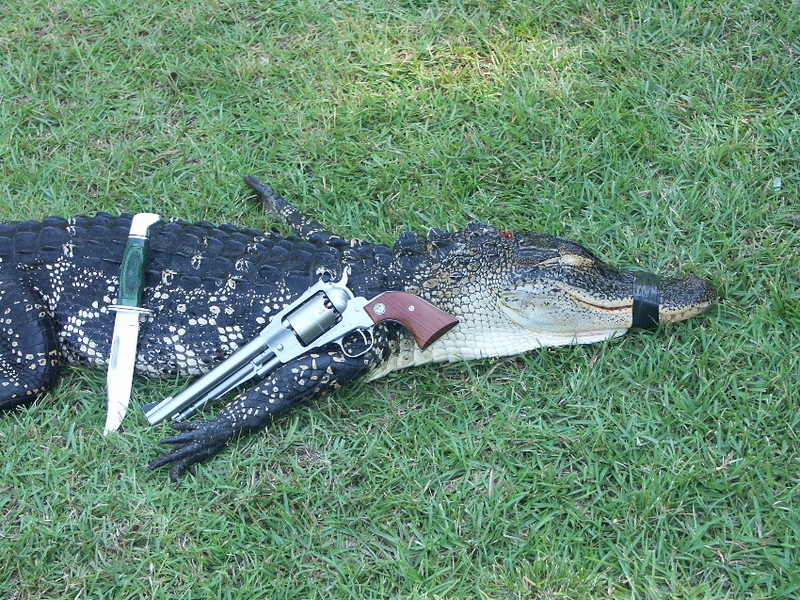 Both a pistol bullet in the brain and a knife thrust through the spine are used to dispatch alligators. range of a few inches from the skull. Similarly, when it comes time to kill livestock an expanding bullet shot at very close range that ranges forward from the back of the skull towards the nose is very quick. I once refused to attempt a neck shot in Ireland at the biggest red stag I ever saw because I was shooting from an unsteady platform and could not hold the scope steady on such a small target. I don’t even like such shots at squirrels and rabbits with a .22 L.R. There is not much meat on the ribs and even passing a .45-caliber ball through a squirrel’s midsection does not result in much loss of eatable meat. It is always the hunter’s responsibility to kill game quickly. Except under absolutely ideal conditions, I think that most hunters would do well to avoid neck and head shots and put the bullet squarely into the heart-lung area. For more information on game shooting consult the author’s book, Backyard Deer Hunting: Converting deer to dinner for pennies per pound and visit the website www.hoveysmith.com. The subject of “head or neck” shots remains controversial, and is undoubtedly based upon the fact that very few people are “good shots”; or at the least “good enough” to be trusted with the serious task at hand. I have an eighty years old friend who spends time with family in Australia every winter and it was some years ago that he met a meat hunter down there who offered to take him ‘roo hunting at night: but only if he could “shoot”. My friend is a long-time good shot and was able to satisfy this other man’s strict demands regarding head or neck shots only. My friend has since been going on these rewarding commercial meat hunts for a number of years now and has bagged his fair share of the harvest too. The scoped rifles they use are of .223 calibre and all shots are taken off of a solid rest, generally at 100 yards or less. Apparently depth perception plays a part when using this lamping method; thus the self-imposed short range limits. My friend in New Zealand has taken hundreds of reds down there at night with a partner packing a 12 volt car battery in a cut down plastic Jerry can made into back pack. This powers a modified car head lamp and again all the shots are taken at the head or neck to preserve the most meat. In fact I believe that such non-contaminating humane shots are a legal requirement in both of those counries, where such meat is destined for sale and eventual public consumption. As with the many other activities some choose for fun and recreation there are everyday folks out there in this world who do it for a living and they should be recognised for their honest abilities to do it well. A good comment, as always. My hunting tools are not so precise and my eyesight is getting worse every year, particularly with iron sights. As a gun writer I shoot almost every critter I take with a different gun. I seldom have the opportunity to work up high-precision loads or shooting techniques. With all of these factors stacked against me, I stick with body shots. Average hunters who often shoot their deer rifles only a few times a year are similarly disadvantaged. Hunting wild game for meat to sell on the open market is illegal in the U.S., so the issue of body shots does not often come into play for most U.S. hunters. A limited exception is ranched game, such as buffalo. Here the carcass must be federally inspected before it may be sold and only head and neck shots are permitted. If the hunter makes a body shot he must pay market price for the entire animal, and that is a lot of buffalo burgers.